Of local historical significance as an example of a locally-unique land use which reflects the European and, more particularly, Mediterranean influence, on the landscape of Melbourne's western suburbs following World War Two. This is especially demonstrated in the rows of olive trees and prickly pear. The site is also of interest for its possible association with earlier farming practices in the municipality. 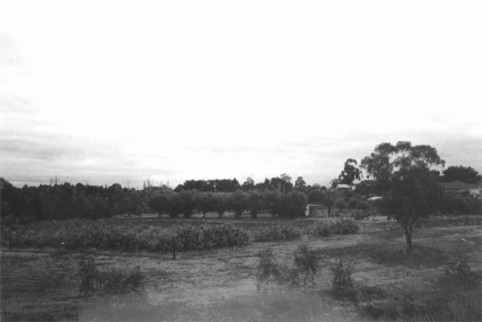 A small area of market gardens on a sharp bend of Kororoit Creek and enclosed on three sides by the creek. It is located at the north end of Yallourn Street and is associated with a large brick veneer at number 56. The land is flood-prone, but sloping and composed of fine alluvial silt. The gardens include fruit and olive trees, the latter forming a row along the edge of the cultivated plots. Prickly pear has also been used as a form of hedge or window plant. It is currently the main crop. As a landscape of post war origin, which is still being actively cultivated, the area is intact. The olive trees suggest some age, possibly 30 or 40 years, but there are few other mature plants.